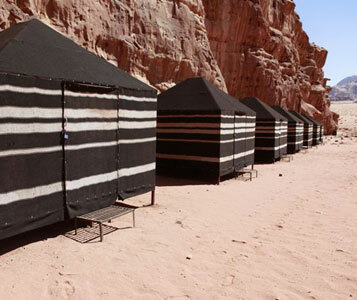 From the red rose city of Petra to the “nomadic mode” of the Bedouin life. Nine days, discover the red rose city of Petra, follow the King’s Road and visit the stunning Kerak crusader castle, float in the Dead Sea or bathe with colourful fishes in the Red Sea and make your escape from modern life for 4 days, riding camels in the Wadi Rum desert, camping with Bedouins at different spots every night, in the nomadic “mode”. Departures guaranteed from 2 participants with overnight in our fixed bedouin camp during the trail and adapted itinerary. You will leave Petra after breakfast and after one and a half hour driving, you will arrive in Wadi Rum village where we will meet you at Jordan Tracks office for tea and introductions with your Bedouin guide. After you have said hello to your camel, you will begin riding from the village and we cross the red sand dunes, stopping to look at the ancient Nabatean inscriptions in Umfashieh. After a relaxing lunch in the sand dunes, you will cross Um Ischreen valley, arriving at Barragh canyon. You will spend the night in the bivouac camp at the entrance of the canyon. After breakfast, cross Barragh canyon with a stop at the ancient Nabatean well, where you can listen to its extraordinary echo feature! Lunch will be with a panoramic vue of Schgaig mountains. In the afternoon you will travel through a smaller mountain range, passing the special mushroom shaped rock. You will spend the night in bivouac at the foot of Jebel Burdah. Today we head south to Um Umgur valley and the white sandy valleys that characterise the southern desert. Lunch is in the shade of Um Umgur mountain., and you will have a full afternoon to explore this wild area and stop at a Bedouin dam still in use by our families. In the evening we will stop in the valley of Umsabatah, famous for its beautiful sunset views, for our last night in this special place. For our last day our caravan rides through Saabata valley, crossing in the direction of the spring area where you will visit Qatar and Lawrence springs, where Bedouin families still to this day come to their goats and camels. Indeed it is the presence of this water that permitted the ancient Nabateans to live in the valley, and thanks to this the area became an essential element for the passage of caravans on the trade route to Aqaba. In the afternoon you will transfer from Wadi Rum to Aqaba, the southernmost point of Jordan on the shores of the Red Sea. Dinner in Aqaba will be taken in the well-known Ali Baba restaurant, famous for its special local dish sayadiyah, prepared with fresh fish from the Red Sea, and rice. Overnight you will stay in central Aqaba in a 3 star hotel with its own swimming pool. Today we will transfer you to the airport at a convenient time for your flight back home. .